Check in to your hotel in Trier, drop your bags, and meet your tour guide for a 2-hour walking tour of the city. With a private guide, take advantage of the time to ask questions and focus on the sites that are of particular interest to you. Learn about the city’s history and its reputation as the “second Rome,” due to its abundance of Roman artifacts and architecture. Stop at the Kaiserthermen, one of Trier’s UNESCO World Heritage Sites, to explore the labryrinthine bathing chambers or check out Porta Nigra, the city gate dating from the 2nd century AD. Site selection is weather-dependent. Walk through the aisles and stalls at Trier’s busy Hauptmarkt and pause to take photos of Trierer Dom (the Trier Cathedral) before visiting the Konstantin Basilika, Constantine the Great’s Roman Throne Room. Wind down your day with a wine tasting featuring the region’s mineral-rich varietals. Learn about the origin of the grapes and how the wine is produced while you sip, then move on to dinner of regional specialties in an Old Town restaurant. Spend a comfortable evening at your 4-star accommodation. 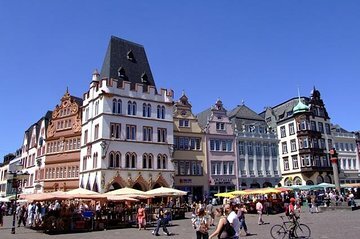 After an included breakfast at your hotel, spend a free day in Trier. Stroll around the city at your leisure, spend time on the banks of the Moselle River or make use of your included hop-on hop-off bus tour. With your ticket in hand, climb aboard the open-top hop-on hop-off bus. Hit all the important landmarks and attractions around the city, including the the Karl Marx Haus and the Roman Amphiteater. See the Itinerary section for a full list of stops.